The Hotel Bernini Palace lies in the heart of Florence, just a few steps from Galleria degli Uffizi and Piazza della Signoria as well as from shopping streets like Via Tornabuoni. We are ready to welcome you and give you a really unique and unforgettable stay. Among long corridors scattered with antiques you'll find refined spaces, smart ambiences recalling the charm of the ancient glories of this palace, which dates back to the XV th. century. 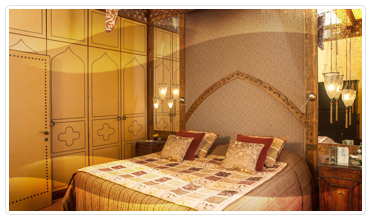 The hotel offers accurate common areas, with sophisticated rooms capable of meeting all your requirements. Particular care is devoted to the cuisine: Ristorante La Chiostrina with both traditional and innovative dishes makes you savour the richness and the variety of Tuscan and national cuisine, whereas the Lounge Bar is the perfect destination in case you want to enjoy a moment of relax sipping a cocktail or renowned wines accompanied by tasty appetizers. The ambience is really splendid: you'll be surrounded by the charm of a private salon, which boasts traditional Tuscan furnishings with a balanced touch of modern design, in order to please the tastes of our international and cosmopolitan clientele. We remind you that breakfast can also be served directly in your room. Free Internet WI-FI is available in the whole structure.